Final words on PowerPoint — the visual aid I wish we could live without. Check previous blogposts in this series for some help in how to have a less-awful PowerPoint experience. But even after you’ve gotten the right attitude about not using your slides in place of an outline, and after you’ve paid attention to getting the best slides in terms of text, graphics and your delivery, there are still a couple issues that can trip you up badly about integrating PowerPoint seamlessly into your presentation. Always be sure to test your slides – all of them -– as soon as you get your A/V materials ready. Project them in a large room onto a screen or the wall so you can see them as they will appear to your audience. Besides any last typos, check to see if the colors work, if the type is legible or too small, if your slides are too cluttered, etc. There’s a big difference sometimes between how things looked on your computer screen and how they appear projected up on a screen. Practice using your slides prior to giving your presentation. Integrate them into your practice sessions until that you can transition without glitches. And work out any other kinks you’re experiencing, or, if need be, re-do your slides to eliminate the difficulties. This is especially critical if you will be presenting in a courtroom. This will help make your presentation smooth and polished. Make sure you work with your slides, and finalize them, at least a week in advance. You want to give yourself time to make any adjustments necessary. Last minute changes can be difficult and, at times, expensive. Always make sure you give your slide deck to the organizers (if you aren’t using your own laptop) by the deadline they have given. It is incredibly risky — not to mention rude — to email a slide deck to the organizers on the night before a presentation or, worse, to show up at the event and hand a flash drive to the on-site person and expect them to make it all work perfectly for you. 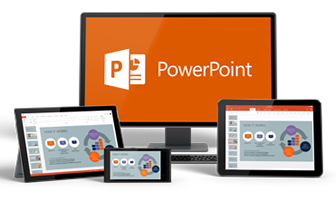 If you have been tuned in you’ve got some tips on get the most from the text and the graphics on your PowerPoint slide, even though I’m no fan of PowerPoint. But now that you’ve got some slides that are hopefully not-awful, here are considerations about how to present. This may seem like common sense, but I have seen good speakers lose major points by bad PowerPoint delivery. Number one rule: Do not, and I mean do not, deliver your presentation directly to your visual aid! Think about it this way: When you have a conversation with a friend over coffee or dinner, do you want to be looking at the side or back of his or her head? No, of course not. Nor does your audience. Turning and delivering your presentation to the screen is a horrible habit that far too many speakers indulge. Train yourself not to do it (or skip the Power Point altogether). Of course, if you are doing as I suggested and working from a speaker’s outline instead of using your slides as a substitute, you shouldn’t have any problem following this rule. If, God forbid, you are using slides as your speech outline, at least look at your laptop while you talk and not the screen behind you. After all, it’s not as if it were the bad old days of overheard projectors where you had to make sure they were right side up! Be grateful for technological improvements, and face forward! Timing, timing, timing — When using slides, always allow your audience the time it takes to absorb the impact of what is on the slide – especially when your slide packs powerful visuals. If you don’t feel like you can take that much time, then you need to cut down the number of slides you are using. The correct solution is never to rush through your slides so fast that your audience gets irritated with you. Either take your time or don’t bother. Blanks are better than mixed messages — “Blank” your screen or use empty slides when you are not talking about what is on the screen. I recommend learning how to “blank” your screen using a toggle (press on/press off) switch on your computer. Usually it is Control F5, but it depends on the laptop – ask your IT person or read your manual. It is important to blank the screen (or use blank slides at key locations) when you have moved on to a new topic because talking about one concept while another concept is up on the screen is distracting for your audience. Screen placement — Talk to the event organizers prior to your presentation and make sure the screen is off to the side and is not the center of attention. This may sound counterintuitive, but the simple truth is that the audience is there to hear you speak. You, in turn, are there to talk with them. Therefore, you should be at the center of attention. The last thing you need is a 6’-8’ screen in the front of the room, dominating the space, while your podium is pushed off to the side. Command the focal point of the room yourself.